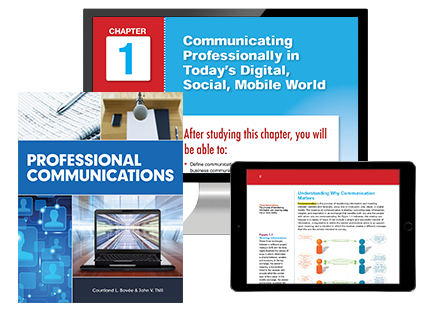 Professional Communications equips students with fundamental skills for a career in the modern, mobile workplace. With comprehensive coverage of writing, listening, and presentation strategies in a contemporary context, this text balances basic business English, communication approaches, and the latest technology in one accessible volume. Students will discover how business communication differs from personal and social communication and see how today’s companies are using blogs, social networks, podcasts, virtual worlds, wikis, and other technologies. A simple three-step writing process works for all types of writing and speaking projects, both in school and on the job. 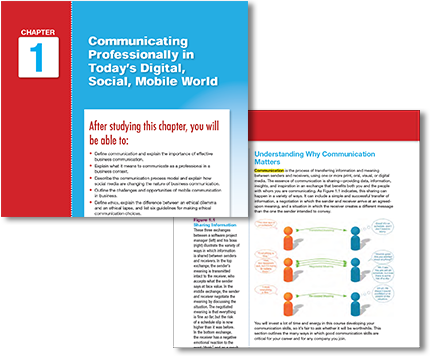 The text provides valuable insights into ethics, etiquette, listening, teamwork, and nonverbal communication, along with effective strategies for the many types of communication challenges students will face on the job—from writing routine messages about transactions to producing complex reports and websites. 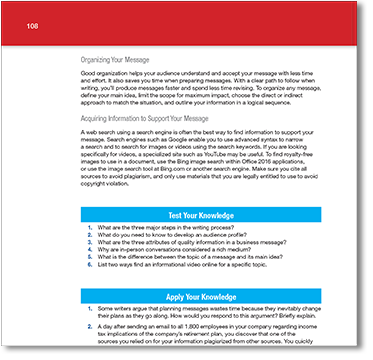 Key features found throughout every chapter support student learning and make it easy to follow along as new concepts and terms are introduced. The Activities section provides a series of sample exercises that help increase students’ familiarity and comfort level with the skills taught in the chapter. 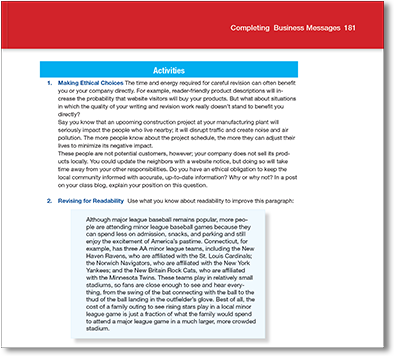 Chapter summaries, Test Your Knowledge, and Apply Your Knowledge sections at the end of each chapter enable students to verify their grasp of important concepts and to think critically about what they’ve learned.